earlier today I was talking about the importance of money and particularly the dominance of the US$ as the reserve currency of choice on a global basis, in the context of the MMT (Modern Monetary Theory) where the holders of a reserve currency are at liberty to print money to suit their needs. Once grasped in principle it becomes more understandable why America is determined to defend its position as the holder of so major a stake in the financial world, a determination that will brook no interference however brutal their response must be to retain the position. the destabilisation of the Middle East immediately after WWII to break Britain’s hold in the area which controlled not just the region but also the currency in which oil was traded globally. The slaughter of 100,000s in two wars in Iraq which looked all too likely to unseat the US$ as the trading currency for oil world wide, with their plans for an oils spot market under the control of Iraq, Iran & Saudi at the forefront – a spot market through which ALL Middle Eastern oil would flow and which China had already indicated it was willing to use! The destruction of Libya and the murder of Gaddafi whom they had for years been trying to vilify. I have posted several articles regarding these issues on this site, you might care to track them down and read them if you wish to understand just what underpins ALL currency values world wide – Yes to a large extent war, be it in arms supply, arms purchase and relativity of ones currency and worth to the Reserve Currencies of choice! To start your quest, may I suggest you watch this video which may well give you a rather better understanding in that at least you will call into question the destruction of Libya, the murder of Gaddafi and the myths and propaganda of the so called Arab Spring! I hope that broadened the understanding of what is being done in our name! Now perhaps you will realise why reading in depth might help – I have also written much on the Lockerbie Black Ops. incident of Pan Am 103 21-Dec-1988. 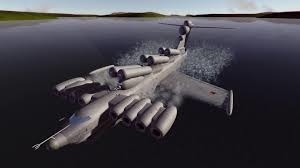 Not to be confused with the downing of Korean Airways KAL 007 on 01-Sep-1983 which was downed legitimately by Russia for spying on Sakhalind Island and the submarine base in the volcanic caldera at Simushir Island at 47-08′ 30 N x 152-13’10 E, a caldera open to the Pacific! the Ekranoplan low level high lift military transporters on the Caspian see this video!